Years 5 and 6 have had lots of fun making 'St Michael's Pipes of Peace, 2014' this week, a modern remake of Sir Paul McCartney's 1983 classic. We thought this resembled Sainsbury's Christmas advert, which depicts the Christmas Truce (ceasefire) around Christmas 1914, when soldiers crossed trenches to exchange seasonal greetings and talk. The video was put together using the camera on an ipad/iphone and the app iMovie. Please enjoy and share our Christmas Wishes! The last session with Y4 today and we were creating snowflakes in Logo. The children were using all they had learnt over the weeks (e.g. typing commands, using repeat commands, creating procedures, using variables) and pulling them altogether to create a unique Snowflake. Watch the video below to see their finished attempts - well done Year 4! It is always really great to see the children taking the skills we learn in school home, and 'playing' with what they have learnt. You always achieve more when you enjoy what you are doing! Please see Hannah's Angry Soldier animated GIF image. Today, Y6 were having fun making animated GIF's for Christmas. They used PowerPoint to draw their pictures (as last week) The children used www.picasion.com to generate animations of their pictures. They are very pleased with their work as am I. Well done cedars! Today Willows class were continuing their 'Control' work with Pro-Bot. We were writing a series of commands to help Pro-Bot draw some shapes, which included some maths work on angles! The children were amazing and really showed they have come along way this term, moving on from simple commands with Bee-Bot to Written commands with numerical data (including angles). Willows class were also programming on-screen robots to complete a series of challenges. They had to guide the Robot to a target area. I asked the children to practice the skills developed with Bee-Bot and Pro-Bot, and to write the commands before testing them out. Have a look at the thumbnails below to screen their commands and outcomes. 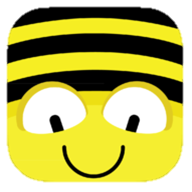 Willows, keep up the programming in the Christmas break by downloading the free app Bee-Bot. Click on Bee-Bot to take you to the iTunes link. Y4 had a WOW moment today, when they saw their procedures combine to make some amazing patterns. What a great lesson! Today, Cedars class were getting into the festive spirit. They were creating Christmas pictures using the 2Simple programme - 2Paint A Picture. The children used a variety of tools including: pens, fill, undo, shapes, colours and lines. I'm so pleased to have reached 71 followers on our school Twitter feed, but we could still do with more! In ICT, we have put up a fantastic display (as you can see in the picture) to promote our Twitter feed. What have you been learning about today? What did you enjoy doing today? This was great. The children were playing marbles (Bee-Bot Wars) with the Bee-Bots. The first person had to program their Bee-Bot to a safe hiding place. The next person then had to program their Bee-Bot to try and hit the other one. The first then had a chance to hit their opponent and so on. Kimi is our reigning champion, he even beat Mr Davies! The children programmed the on-screen robot to draw shapes just as they had with Pro-Bot. They then took on the Purplemash Challenges, of programming the robot around different routes and negotiating the obstacles along the way. The children were totally enthused today in Logo! They were creating regular polygons, but to save time using repeat commands e.g. repeat 4 [fd 150 lt 90]. We looked at example commands and tried to predict what shape would be created when the 'Execute' button was pressed. Can you predict the following?